Let me begin by attempting to promise not to call Stellan Skarsgard Bootstrap all the way through this. At first glance, this London crime drama seems like any other. 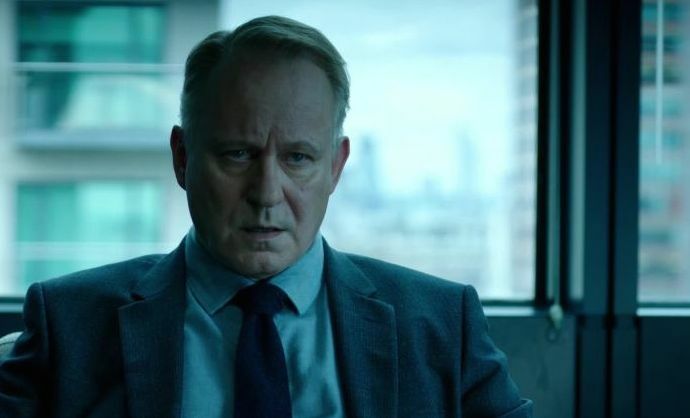 Two officers, Skarsgard taking the title role as John River; and Nicola Walker accommodating the role of Jackie Stevenson or Stevie. River seems to be a bit on the miserable side of life but appears comfortable with Stevie. The pair are juxtaposed, just as any two detectives should be on television, Stevie cracking jokes and trying to enjoy herself, whereas River is the silent Swede, fully focused on the case. As the narrative develops, it is revealed that Stevie, who has been interacting and conversing with River all along, is actually dead. Recently murdered but the case is yet to be solved, however River has been talking to her since her demise. It’s not just her that he sees, it’s victims of cases that he is working on too. Now, what I thought was interesting was how the show developed after they dropped that bombshell. Stevie’s apparitions are not constant, however River has no control over them. Ira King (Adeel Akhtar) is brought in as Stevie’s replacement, suspected of being more of a babysitter than a partner. This sets up a divide between River and his colleagues; those trying to help his mental stability and those eager for his downfall, because of his imminent mental breakdown. Seeing dead people isn’t considered the norm, or so I’m told. King’s character acts as the comedic relief when River is having an episode. Often breaking the tension with just a solitary word or a few syllables. The relationship between River and King gradually stems into one of trust and the chemistry between the pair is thoroughly enjoyable to witness. Akhtar playing his role extremely well, as he introduces his partner in the wonders of modern day technology. King is well aware of Rivers odd tendencies, having witnessed it first-hand. . The supporting cast has been very well selected and worked around the primary characters. Those who are fans of HBO’s Game of Thrones will recognise a few familiar faces, with Owen Teale being just as much of an arse as he is on The Wall. Skarsgard delivers an intensely powerful performance throughout the series, but at first I struggled to justify why it was necessary for a Swede to take on this role; maybe so the writers could throw in an ABBA pun or two? However, as the primary plot line unveils itself, it makes more sense. The show tackles the social and political issue of immigration, I won’t spoil anything, but it becomes quite key in the narrative. Once all is revealed, my initial doubts on the casting choice are put to shame because if River was British, he would lack any empathy towards certain characters. The growth of the story and the characters is subtle but devastatingly effective. It seemed that there was always a red herring lurking around somewhere. I have high hopes for the second series as Abi Morgan, the mind behind River, has generated a wonderful ensemble of incredibly diverse personalities. Although the show is based in London, it still confines itself to a bubble within the city, almost dystopian. As long as the writers don’t get too ambitious with unrealistic storylines, I think this series will prevail and retain its already captive audience. It’s up there with the likes of Luther and Sherlock. And I didn’t call him Bootstrap once!